Economic data will move to the fore next week with several countries reporting inflation, retail sales and flash PMIs. 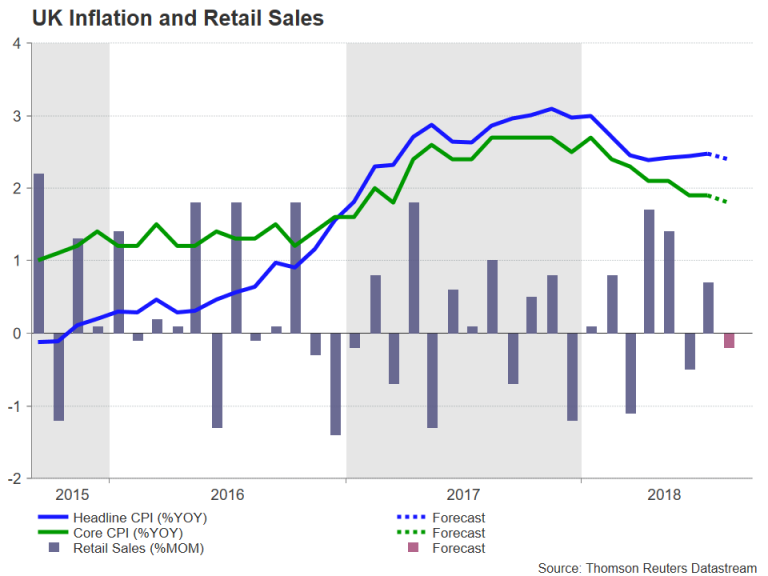 Canada and the United Kingdom will publish CPI and retail sales figures, while in the Eurozone, the focus will be on the flash PMI releases by IHS Markit. 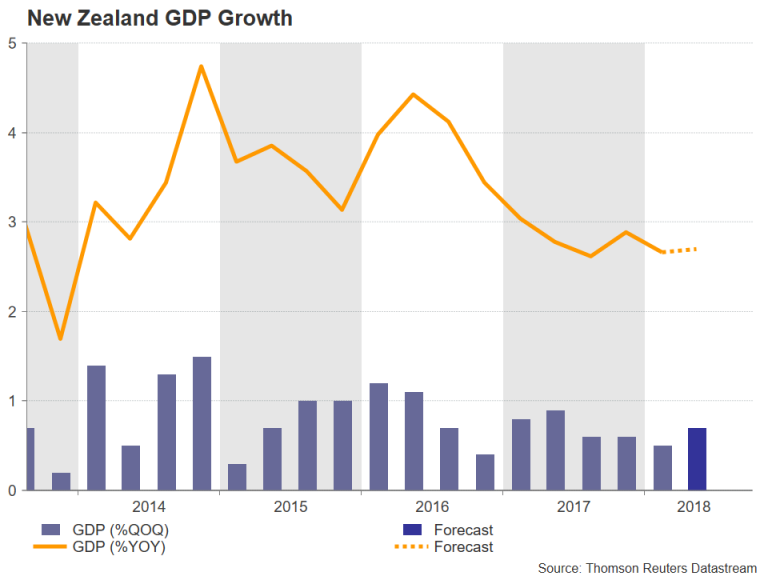 Second quarter GDP figures out of New Zealand will be another highlight. Central bank activity will also keep the markets busy as the Bank of Japan and the Swiss National Bank hold policy meetings. The Bank of Japan made several modifications to its program of “Quantitative and Qualitative Monetary Easing with Yield Curve Control” at its July meeting. The yen managed to avoid a sharp appreciation as the BoJ succeeded in convincing markets that allowing long-term yields to trade in a wider band does not translate to tapering. With no change in policy anticipated from the BoJ on Wednesday, investors will likely turn to Friday’s inflation numbers. The 12-month core CPI rate, which excludes fresh food prices, is expected to inch up to 0.9%. A stronger-than-expected figure would be positive for the yen as it would increase speculation of the BoJ lifting interest rates out of negative territory sooner rather than later. Other data to keep an eye on from Japan next week are the August trade numbers on Wednesday and the flash manufacturing PMI on Friday. 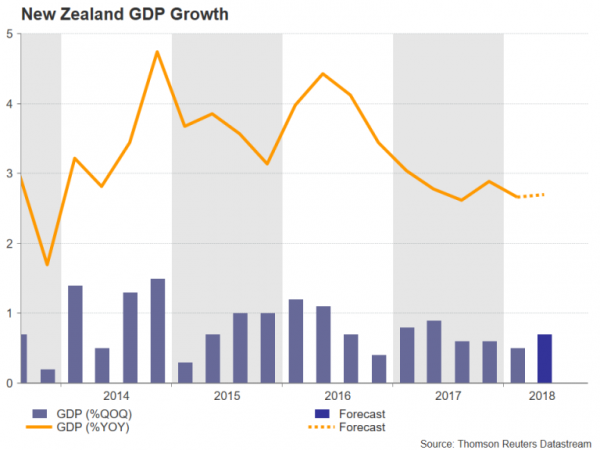 New Zealand’s GDP numbers for the second quarter will be watched closely on Wednesday as incoming data continue to point to weakness in the economy. The country’s GDP is forecast to have expanded by 0.7% quarter-on-quarter in the three months to June, improving from the prior quarter’s 0.5% rate. The annual rate is projected to have increased by 2.7%. A worse-than-expected reading could bring the Reserve Bank of New Zealand closer to a rate cut and that could send the kiwi spiralling below this week’s 2½-year low of $0.6499. 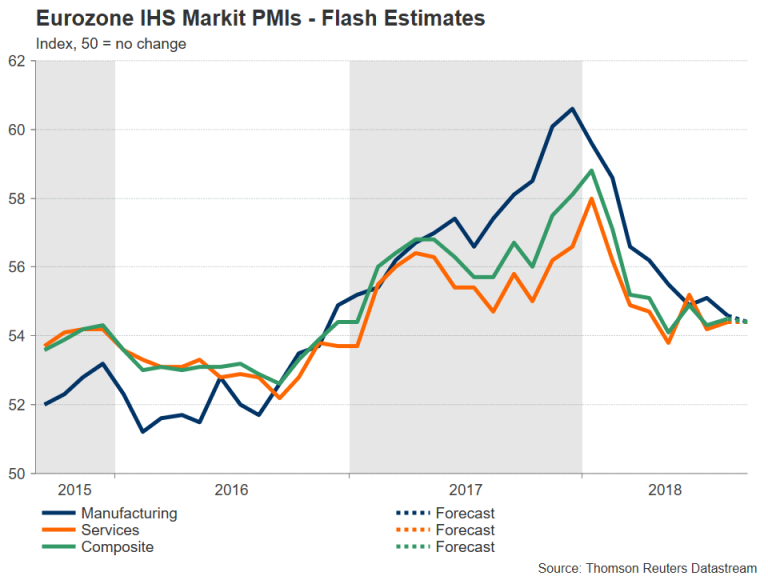 The flash IHS Markit PMIs will be the only focal point for the euro in the coming week as the Eurozone calendar will be rather light. The final CPI print for August will start the week on Monday but is unlikely to attract much attention as no revision to the preliminary reading of 2.0% year-on-year is anticipated. It will be followed by the flash consumer confidence release on Thursday before traders are drawn to the flash PMIs on Friday. The composite PMI, consisting of both the manufacturing and services sectors, is forecast to decline by 0.1 points to 54.4 in September. A surprise stronger reading could be viewed as a sign that worries in the bloc over a global trade war are subsiding, indicating faster growth in the months ahead. Eurozone growth has failed to bounce back from a slowdown at the start of the year and a change in the outlook would drag the euro out of neutral mode. The Swiss National Bank will once again follow in the footsteps of the European Central Bank, which met this week, and keep interest rates unchanged on Thursday as the central bank continues to fret over an overvalued exchange rate for the franc. Concerns about the Italian budget and the turmoil in Turkey drove the euro briefly below the 1.12 level versus the safe-haven Swiss franc this week before bouncing higher. The rebound was a bit suspicious and could have been down to intervention by the SNB, though it did coincide with a drop in Italian-German yield spreads. The SNB is expected to continue to highlight the “highly valued” franc and will probably keep the 3-month LIBOR target range at between -0.25% and -1.25% until at least after the first ECB rate hike in late 2019. In contrast, Norway’s central bank, the Norges Bank, is widely expected to raise its key policy rate from 0.50% to 0.75% on Thursday, in what would be the first increase since 2011. The Norwegian krone has been rallying agianst the dollar and the euro during September. It could extend its gains if the Norges Bank couples the rate increase with a steeper rate path guidance. Brexit talks between the UK and the EU are expected to be stepped up in the coming days with the topic likely to dominate the informal summit of EU leaders in Austria on September 20. Sterling should therefore continue to see high volatility as it remains sensitive to Brexit headlines. The currency got a boost during the past week on signs the EU is prepared to make some concessions to the UK in order to avoid a disorderly Brexit. Upbeat economic data also contributed to the bullish momentum, although next week’s indicators may not be as positive and could fail to provide support for the pound in case the Brexit negotiations were to break down. CPI figures will be watched on Wednesday for evidence that inflationary pressures in the UK continue to edge lower towards the Bank of England’s 2% target. Headline inflation is forecast to dip back to 2.4% y/y in August, while the core rate is predicted to fall to 1.8% from 1.9% previously. Retail sales numbers will follow on Thursday and are expected to show a 0.2% month-on-month contraction in sales in August after a 0.7% bounce in July. It will be a relatively subdued week for the US over the next seven days with few top tier releases on the schedule. The New York Fed’s Empire State manufacturing index for September will be the only highlight on Monday before the focus shifts to the housing market on Wednesday with the release of August building permits and housing starts. On Thursday, the housing theme will continue with existing home sales, while the Philly Fed manufacturing index will provide a second look at manufacturing activity in September. 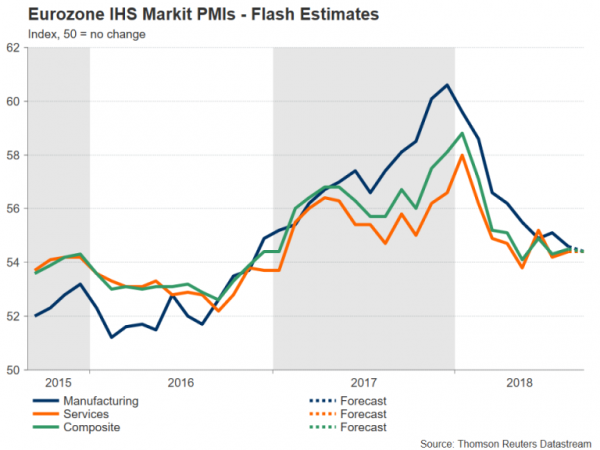 The final gauge for the sector will come from IHS Markit’s flash manufacturing PMI on Friday, which will be published alongside the flash services PMI for September. The absence of major data next week means the US dollar would be vulnerable to trade-related safe-haven flows. With the possibility that talks between the US and Canada to update NAFTA could go on until October 1, which is the deadline for submitting an agreement to the US Congress, traders will have economic numbers to turn to for distraction. Manufacturing sales for July are out first on Tuesday, with the remainder of releases not due until Friday when attention will fall on the latest inflation and retail sales figures. Annual inflation surged to 3% in July to the highest since 2011. A further acceleration in August would strengthen the odds of the Bank of Canada raising interest rates at its October policy meeting, helping the Canadian dollar advance beyond this week’s 2-week high of C$1.2971 per US dollar. As for retail sales, it’s been a more mixed picture, with sales slowing notably since late last year. However, another unimpressive figure for July is unlikely to be enough to deter the BoC from hiking again soon. Next articleIs the US Economy Running Out of Labour?